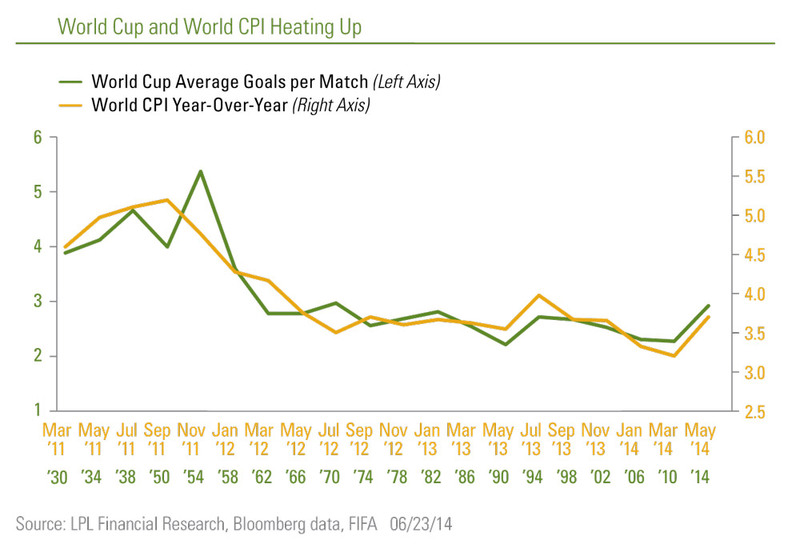 The global soccer tournament is seeing more goals, and the world's central bankers are facing some signs of inflation. There are tricky situations on the pitch in Brazil, with the U.S. facing a tough match against Germany on Thursday, and in the global economy due to rising oil prices. Analysis done by Kleintop reveals that global CPA and the average number of goals scored at the World Cup, with both heading higher. So far in the 2014 World Cup, the average number of goals scored per match is close to 3, making the tournament the highest-scoring World Cup since 1970. While higher temps might produce more mistakes and greater emotion – Uruguayan player Luis Suarez may have bitten Giorgio Chiellini of Italy during a match on Tuesday – the CPI complicates the tasks facing central bankers, “increasing the risk of mistakes that could have market implications,” Kleintop says. The conflict in Iraq and associated security issues in the wider region are fueling a rise in inflation through higher oil prices. “Oil prices are at nine-month highs, rising above $107 a barrel on Friday, as the threat increased of a material supply disruption due to the rapid advance of militants in Iraq, the second-largest OPEC oil producer,” Kleintop said. Just as teams in the World Cup face do-or-die moments, the world’s major central bankers “are nearing critical turning points in policy for the first time since the global financial crisis. Similar to World Cup players, the risk of policymakers making mistakes rises as inflation heats up,” he stressed. According to Kleintop, the Bank of England is more likely to move away from the global trend and raise interest rates in the coming months as inflation rises. “At 3.1%, the economy is growing at the strongest pace since 2007, before the global financial crisis. The BoE could become the first major central bank to raise interest rates since the crisis,” he explained. The financial markets have been assuming a 0.25% rate hike by year-end for England. “However, rising inflation could prompt a more aggressive path for rates and risk a decline in the market with participants concerned about the pace of reversing the stimulus,” Kleintop added. Furthermore, higher inflation could lower the likelihood of more European Central Bank stimulus in the short term. “Europe has a renewed focus on restoring economic momentum and avoiding deflation, and the ECB took action to cut deposit rates below zero in June,” the analyst said. While a rise in the rate of inflation would be welcomed, if it is due to higher oil prices, it also runs the risk of darkening the growth picture “and may limit the ECB’s flexibility to provide further stimulus,” according to Kleintop. Finally, he says, the Bank of Japan could be less likely to extend or raise the current stimulus program despite the economic slowdown. “Market participants have been expecting some additional stimulus from the BoJ in the coming months,” Kleintop noted. But higher oil prices add more pressure to an economy that has already been coping with high single-digit energy price increases over the past year; the CPI in Japan jumped to 3.4% in April, well above the 2% target rate. Check out Kleintop: Forget Bonds, Your Portfolio Needs ‘James Bond’ on ThinkAdvisor.